We’ve talked about it before, the exterior of your building can determine whether or not you struggle with pests down the road. Though it may seem silly for this to be something that you need to worry about as a homeowner or a property manager, it’s the truth. While the quality and appearance of the plants, trees, flowers, and shrubbery that you select can alter the appearance of the property, they can also alter the number of pest control problems that you deal with in a given year. 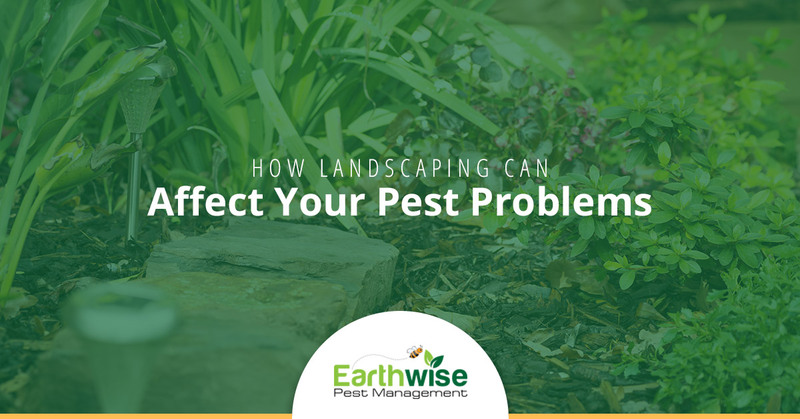 Though landscaping is not our expertise, the team at Earthwise Pest Management has learned quite a bit about the various components of landscaping and how they can affect the pests that you come across. We’re going to cover some of the major landscaping pieces and what you can do and take into consideration the next time that you work on your landscaping. We’re going to start by touching on the plant selection that you make when planning your landscaping. It’s important to learn a bit about the types of plants and shrubbery that you’re going to be including in your landscape before making a purchase. For example, there are certain plants that are known for attracting aphids and other insects that feed on plants. If you’re not knowledgeable about plants and you’re not entirely sure what type of plants you should be looking into, ask a professional. They’re going to be able to tell you exactly what type of plants you should be avoiding and which ones are prone to attracting pests. While your landscape may be beautiful, it’s going to require quite a bit of upkeep in order for it to stay that way. Trimming of branches and shrubs is just one of the tasks that you will need to anticipate doing once you’ve added plants to your landscape. Aside from trimming helping maintain the beautiful appearance of your landscape, trimming branches can also help you minimize pests from becoming a nuisance. Unfortunately, it’s the plants that offer thin branches and plenty of brush that make for great nesting supplies. Raccoons, squirrels, mice and the like are known for using these types of plants in their nests and for traveling from one place to the next. If your landscape is offering up plenty of supplies for these pests to thrive on, then you can guarantee they’re going to be attracted to it and wind up staying for a while. By trimming your branches you can keep any debris from your landscape to a minimum. Maintaining moisture levels is something that you’re going to need to do when you have an extravagant landscape, and mulch is exactly what you need to get the job done. Mulch is a common component of landscaping for multiple reasons. For starters, mulch helps the ground retain moisture which is extremely beneficial for any plants in the area, but it’s also great for pests. Water is one of the things that pests look for when seeking a place to make a home. By adding mulch to the areas around your plants you’re able to minimize the chances of pests like termites and other thirsty pests that are going to turn to your landscape for water. When you decide to add various trees, flowers, and shrubs to your landscape, you’re signing up to water and tend to all of them. Watering is a crucial part of keeping your plants alive, but it’s also something that you need to be concerned about when talking about preventing pests. You see, pests need water just as much as plants do, and if they find a source that provides it to them they’re going to take advantage of it. That being said, it’s important that you ensure that your sprinkler systems aren’t creating a water source for thirsty pests. You should always check to ensure that water isn’t building up or standing because this is exactly what pests are going to be looking for as they search for water. Sticking to a routine schedule for watering will be good for not only the plants in your landscape, but it will also help you keep thirsty pests at bay. A landscape is intended to enhance the beauty of a building, but it can become a little bit of work. While you may not have expected to learn more about landscaping and the process of tending to it, we highly suggest that you do. By expanding your knowledge of landscaping and the ways to make the most of the trees and flowers that you’ve planted you’ll be able to enjoy a beautiful landscape and minimize pests at the same time. Once you’ve begun to learn a bit about the topic, you’ll find that this knowledge will come in handy in a number of ways. From determining which types of plants are most likely to attract certain pests to the plants that will require little to no water, gaining an understanding of what’s going to make your landscape look beautiful and benefit you, in the long run, will be well worth the time that you spend. Maintaining a landscape to look aesthetically appealing is one thing, and while the points that we’ve listed above can help you care for your landscape in a way that can minimize pest control problems, you may need some additional help. Earthwise Pest Management is here to provide you with all of the pest control services that you need to keep your Sacramento landscape at its best! Our team can provide you with a free inspection of your landscape and the area around your home or commercial space. In doing so we can gain a comprehensive understanding of your space and the work that needs to be done to keep it free of pests. Contact our team today if you’re interested in learning more about the consultations that we offer or you’re ready to book your services.